Pursuing plumes Geophysicists recently presented improved methods for imaging mantle plumes, providing the strongest evidence yet that some plumes extend all the way down to the coremantle boundary. Visualized as straws funneling hotter, lower-viscosity rock to hotspots on Earth's surface, plumes have eluded geoscientists ever since Jason Morgan first proposed their existence in 1969. In a talk at last December's American Geophysical Union (AGU) annual meeting, Raffaella Montelli argued that her new methods to interpret the seismic data, developed with co-workers at Princeton University in Princeton, N.J., allow imaging of the mantle with greater confidence. She also presented evidence for more than half a dozen deep-seated mantle plumes. Suzan van der Lee of Northwestern University in Evanston, Ill., calls the new method a "breakthrough." 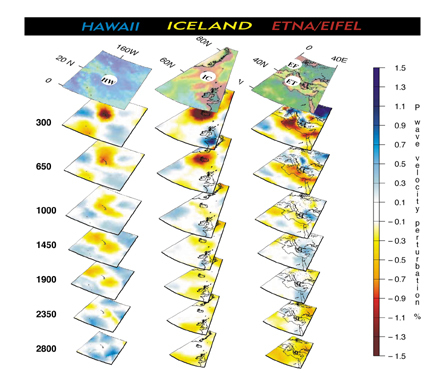 THREE PLUMES: From left to right, the Hawaii, Iceland and Etna plumes extend down into Earth, as imaged with newly modified tomographic techniques. Iceland is not as deep as expected, but Hawaii is, originating deep in the mantle. Montelli and her colleagues did not set out to image plumes, but instead wanted to test some changes they made to traditional seismic interpretation methods of the deep Earth. Mantle tomography, a kind of X-ray imaging of Earth, builds a 3-D model based on how seismic waves change paths when traveling through lenses of mantle material that are hotter or of different compositions; such temperature and compositional changes redirect the waves like a prism. Most researchers take the seismic waves and translate them using ray theory, which models them as straight lines and simplifies wave propagation (like the spread of surface ripples from a rock thrown into a pond). Instead of modeling lines, Montelli's team modeled the zones around them, using so-called banana-donut kernels. Montelli says these packets of information are like "the skin of a banana," following the zone around the ray path of a seismic wave, from its starting point at an earthquake source to a recording device. Because the focus is not on the central ray itself, a slice of it resembles a doughnut. Montelli used datasets from Guy Masters at Scripps Institution of Oceanography, San Diego, and Bob Engdahl at the University of Colorado, Boulder, averaging several types of seismic waves. She also applied an irregularly spaced grid to the data, taking snapshots spaced at 200 kilometers on average near the top of the mantle and shifted to 600 kilometers apart at depth, to take advantage of the higher density of data at the top of the mantle. What the researchers found surprised them: 32 clearly delineated plumes, both shallow and deep  some known and some new. Montelli set about testing the resolution accuracy of each plume model. She determined that at least nine of the plumes could be more or less accurately detected to the bottom of the mantle; the faintness of the plumes at that depth, she says, could be attributed to resolution problems. Donald Vasco of Lawrence Berkeley National Lab, in Berkeley, Calif., says that the technique used to average the data sets will be useful for future work; in the past, researchers have "used only one kind of data to do their inversions, or they've combined data but not as carefully," he says. However, commenting on the team's paper following Montelli's AGU presentation, Vasco says he would have liked to see standard measures of resolution with the plume maps, in order to judge the accuracy at depth for models of the deepest-seated plumes. The work, also published online in Science Express on Dec. 9, is "the first word rather than the last," says Norm Sleep, a geophysicist at Stanford University in Palo Alto, Calif. Montelli succeeded in using both the short and long period information from waveforms, Sleep says, and "at some point, someone is going to figure out how to use the complete waveform." Despite missing some plumes, he says, the new method "is a significant improvement." Van der Lee notes that Montelli's Etna plume matches the hotspot she herself modeled using different data. However, some of the models don't match already imaged plumes, and these "have to be investigated more, but are not a sign that her model is wrong," van der Lee says. "We just don't know enough to resolve fine structures on these plumes," she continues, something more local data and these new methods should allow.